Elizabeth "B.J." Moore, passed away Jan. 8, 2002, early in the morning. As in life, she was loving and considerate, leaving us in her sleep after a lingering respiratory	illness. B.J. was born in Bolivar, MO, June 4, 1923, and came to California in 1935. She graduated from Santa	Paula High School in 1941 and attended Woodbury College in Los Angeles. Most of her life was spent in the Los Angeles area as an enterprising business woman. 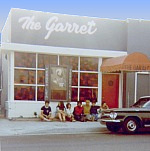 She and her partner, Terrea Lea, owned and operated The Garret coffee house from 1958 to 1971. 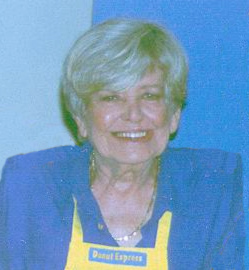 From 1972 to 1978, she designed and built small gift items in a wood shop with partner Sue Tjulander. The three ladies retired and moved to Vista in 1978. B.J. brought the mini donut machine to their attention and the "golden girls" started the Donut Express and have been doing fairs ever since. The Donut Express has been a popular attraction at the Del Mar Fair and the Ventura County Fair (both in California) for the last 16 years. B.J. will be missed by many people who knew her from the fairs and especially those who knew and loved her as a friend. She was generous with her time, fun to be with and a most loving person. Sue and Terrea, who had over 50 years to know and love her, wish to thank you who have responded to their loss and will be forever grateful that she not only returned their love, but played such an important part in their lives as well as the lives of everyone she touched.